Filed under arduino on July 27, 2014. I recently purchased an Arduino Esplora from our local Radio Shack. I chose the Shack because I had a $10 coupon. So after my $10 off, I did pretty well on the purchase. I opened the box and ran through the setup instructions found on the Arduino Esplora page. All went until I tried to attach the provided joystick knob to the joystick post. Seems I have a “round peg in a square hole” problem as shown in the images below taken by Nick Gammon from the Arduino Esplora Forum. 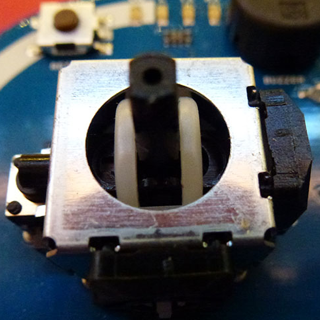 There is no way the Arduino Esplora joystick post will fit into the small rectangular hole on the knob I received. So what’s a guy to do? Take it back to the Shack? Nope. Time to break out the power hand drill. I began using small bits to ream out the square until I had a small circle leading up to a 5/32” bit. That seemed to be the perfect size diameter and once I placed the knob on the post, it was worked well, expect for one small issue. I drilled the hole too deep. I was unable to press the joystick down to activate the center button. So I grabbed some of the shavings and pushed them back in the hole with the drill bit. Finally, I heated the drill bit for a final tamping of the shavings and melted them. Remedy this and place a marker on your drill bit at 1/8”. 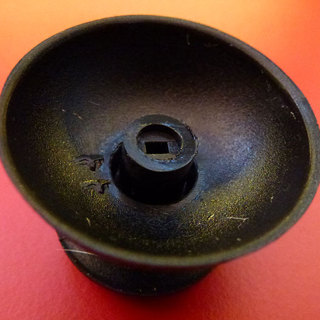 Not sure why my Arduino Esplora came with the incorrect knob, but it does seem to be a common problem. Evidently the quality control folks at Arduino need to have a look at some of their boxes before shipping them. Anyway, it did provide me with a bit of hacking today and if you get down to it, isn’t that whole point of the Maker movement? That’s it for now. Time for me to explore the capabilities of the Esplora.